Today, having a smart TV is not only trendy but also gives a user the comfort of sitting down to watch anything even when streaming online. LG has strived at designing quality and affordable screens. Among the many is the 49” LG 49UF770V. Once you switch it on you will fall in love with the webOS. It knows exactly what it is, and isn’t trying to turn your TV into an overgrown tablet that you cannot touch. WebOS is genuinely smart and with the Magic Remote intuitive to use. It never gets in the way of using the screen to watch content. The sonic performance of those relatively weedy 10W speakers is actually rather impressive for what they are. I’d still recommend additional sound if you really want that cinematic effect, but the onboard audio isn’t that bad. The 4K Ultra HD playback is also impressive, delivering excellent clarity and brightness levels. The contrast performance in dark scenes is good too, despite just using an edge-lit backlighting technique for its localised dimming. However much the 4K performance is good, one may be stuck watching mostly non-UHD content until the providers start upping their game. Secondly, there is a fault with the actual design of the chassis it has less of the luxury feel of something like the Sony panel, and that wide, deep, plasticky foot does not do it any favours, especially if you want to put a sound bar in front of it. 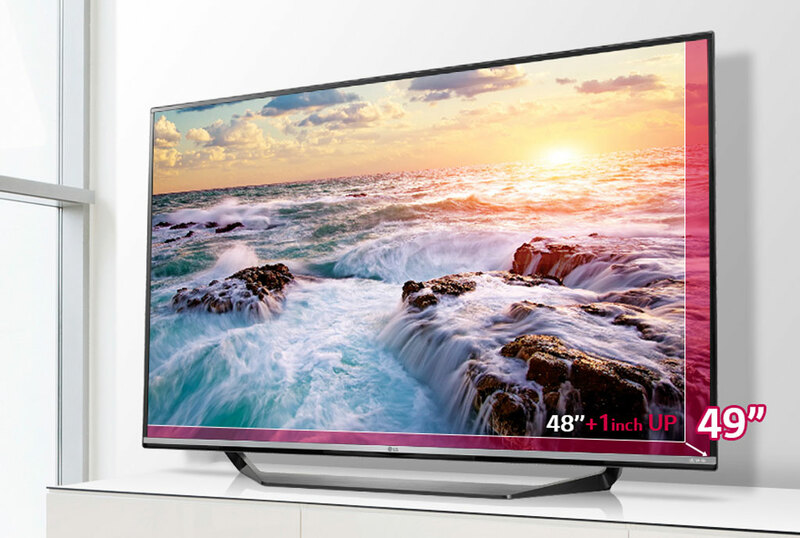 With all this, the LG 49UF770V is a true mid-range 4K Ultra HD set. The 49-inch size is pretty effective for most living rooms however great the temptation is to go as big as you can afford and the Shs3m price tag attached to it.